Deer’s symbolize softness and gentleness and a huge storage of quite inner strength. That is why deer’s have been a prominent fixture in art and literature for ages now. These gentle creatures effectively inspire us to be soft, gentle and kind to our fellow beings and it is for this reason that deer’s have found a place of pride in tattoo art. 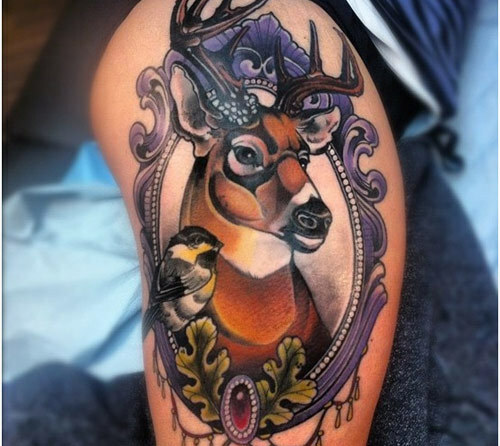 These top ten deer tattoo designs are sure to inspire you enough to start searching for the tattoo expert nearest to you. This deer tattoo in the form of a deer skull has a definite gothic edge to it. Make a note of the use of psychedelic colors that are merged together like a perfect collage. 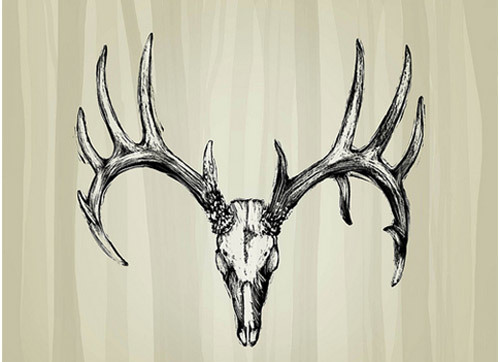 Perfect for the upper or lower back, this deer skull tattoo is best replicated as it is depicted here. 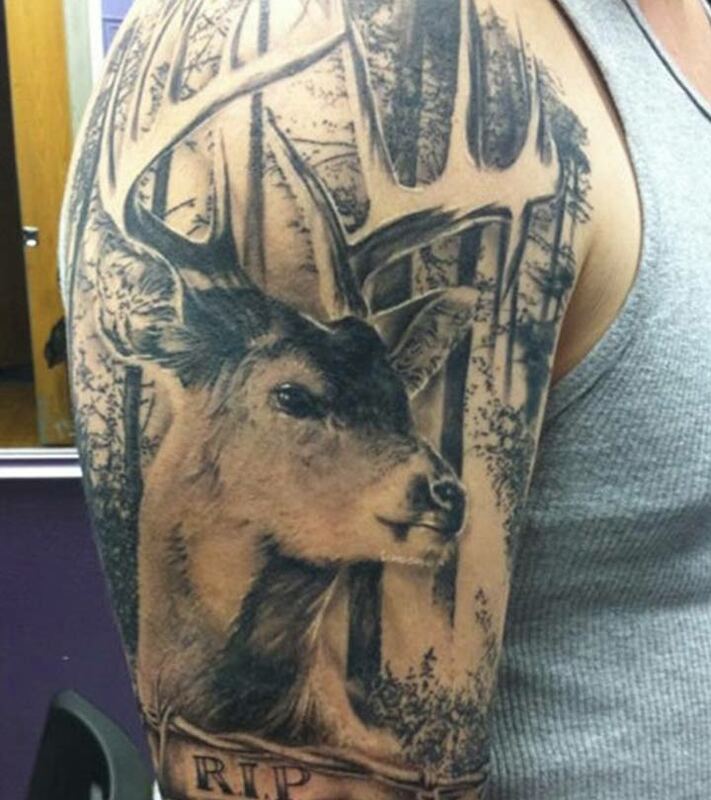 This deer tattoo is almost like a piece of jewelry for your upper arms. Look closely and see the regal looking deer that is accentuated by the embellishments around it. The little sparrow at the bottom only adds to the overall beauty of this piece of art. 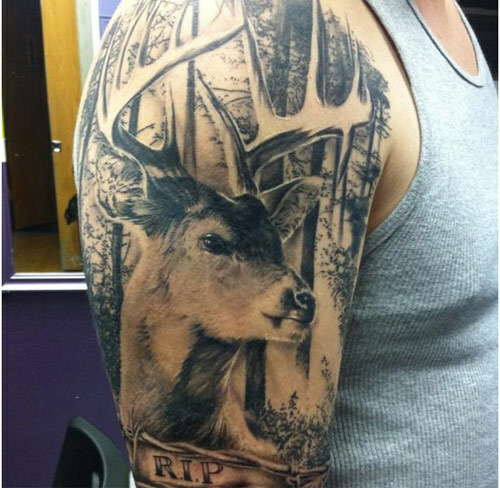 This tribute deer tattoo stands out for its brilliant use of shading that gives it a realistic look that would be a hard job to replicate. Make a note of the shading used to give the deer its furry coat and brilliant details of the foliage in the background. 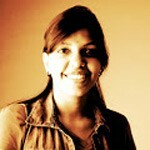 This is indeed a fitting tribute for someone whose memories you cherish deeply. Another deer skull tattoo with a definite gothic edge, this deer skull tattoo is created using black as the only primary color and stands out for its outlining and shading that is apparently the work of a true artist. 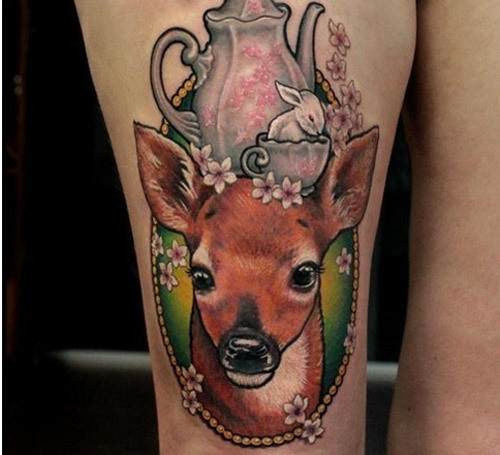 This ornate deer tattoo has a definite feminine twist to it that perfectly adds to a woman’s persona. Make a note of the ornate design surrounding the tattoo, the kettle and the cup, the little bunny and the sparrow. Truly the art of a master, this tattoo stands out for execution and brilliant use of color. 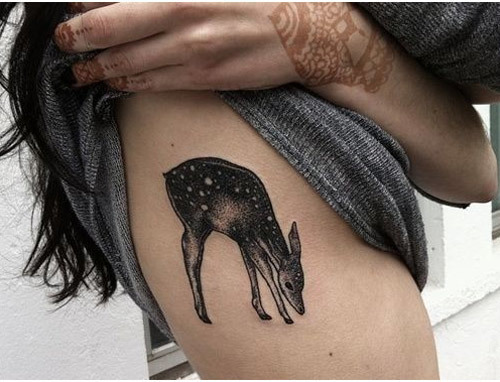 This tattoo depicting a doe or a little deer is noteworthy for its delicate use of shading and miniature size. 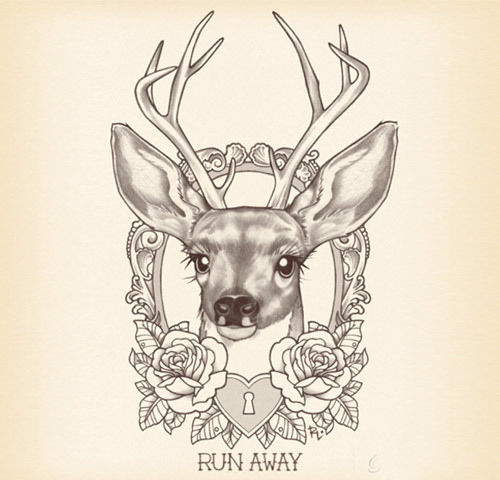 If you are looking for a deer tattoo design that is subtle yet enthralling here’s the perfect design for you to look out for. 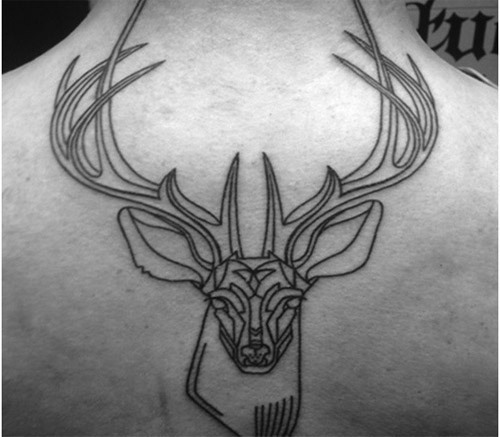 Deer’s have always held a special place in tribal art and this deer tattoo is an effective example of that. This tattoo stands out for its use of bold black lines and is best replicated as it is depicted here. 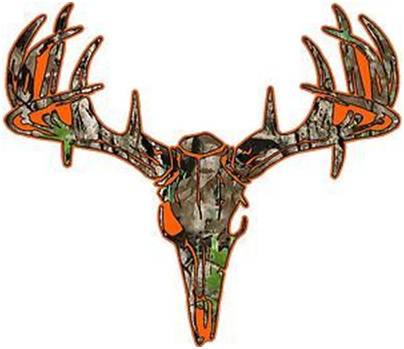 Make a note of the impressive antlers that cover the whole neck and effectively giving off the impression of a unique ornament. This tattoo has a definite feminine angle to it and stands out for its perfect execution and charming conceptualization. However, there is room to experiment with color or size here provided you seek out the services of a seasoned tattoo artist to replicate this piece of art. 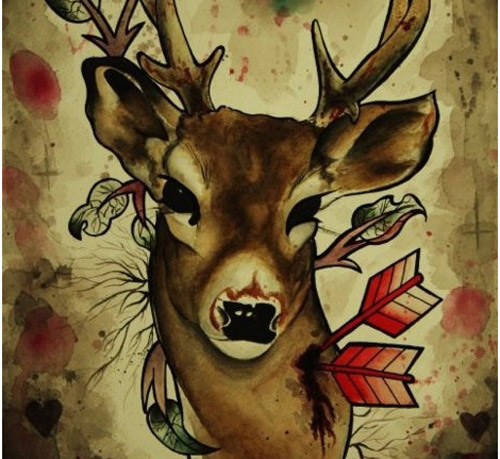 This vibrantly colored deer tattoo has a tragic twist to it with the arrows sticking in to the deer’s neck. However, this does serve as a message against illegal hunting of exotic animals. Make a note of the realistic shade of fawn used to color the deer and the dark expressive eyes that effectively depict deep pain. 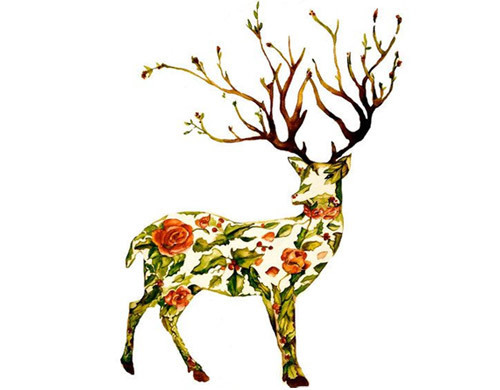 This deer tattoo stands out for its use of floral collage work that is best suited for the female gender. Look out for the vibrant shades of orange and green used to create this masterpiece. 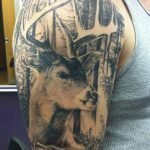 Hope this article on top ten deer tattoos was interesting enough. Do send your feedback on which one is your pick. Tattoo art is a great way to express your-self! Find more than 8000 tattoo ideas in 44 different categories and choose what you like best.